You learn a lot as a first time home owner. About half of that learning comes from making costly mistakes. My pea gravel pathways are a prime example of that. I’ve spent countless hours leveling and sculpting pathways around my beds in order to create a nice harmonious flow throughout the yard. 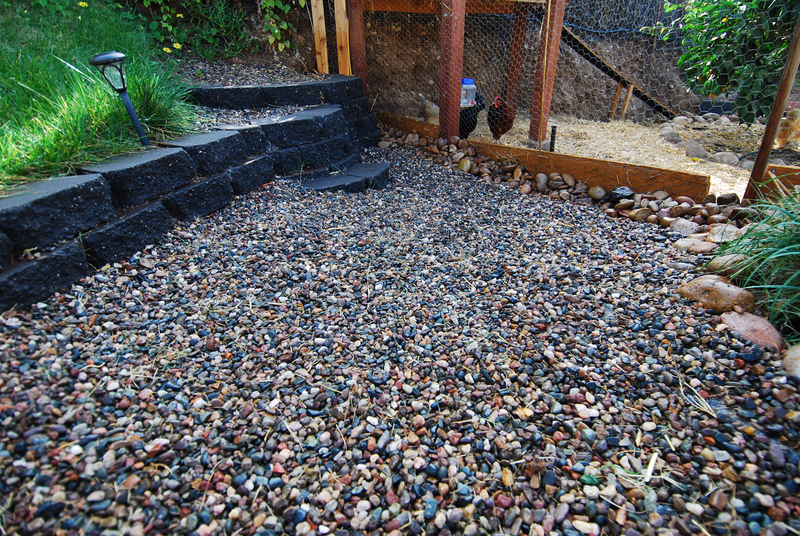 I’ve spent quite a bit of money on pea gravel as well in order to do this. Admittedly, I knowingly took a few shortcuts along the way. And…now I’m paying for it. Big time. 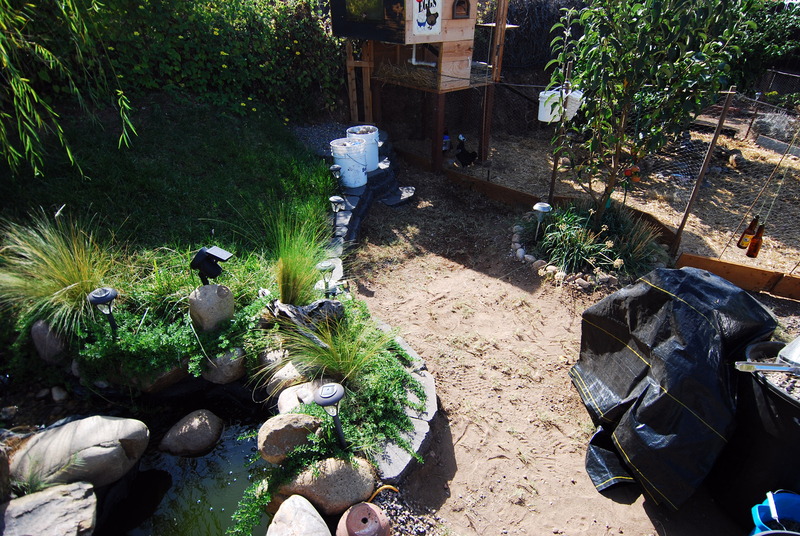 Not more than three months ago, I finished making this lovely grassy knoll with a cute and quaint little retaining wall for accessing the laying box of my chicken coop and for sitting in the shade of my young willow tree. Surrounding that, a nice little pea gravel pathway. In those 3 months, all of that was fairly buried under a blanket of crabgrass. 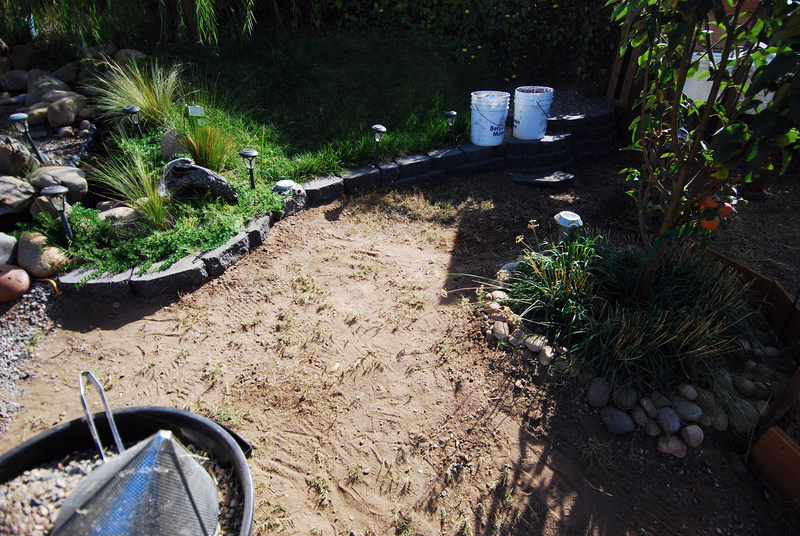 The same crabgrass that I painstakingly removed when I started this project. Here it is this morning. What an unholy hot mess huh. Seething tendrils of green revenge oozing out every surface that was so lovingly placed. I watched this happen slowly over the last few months. Like the mighty Kraken advancing at a planetary slowness and determination, these weeds crept up from the darkness to reach my toes and envelope my pea gravel. And it was all my fault. I tried my best to ignore my blunder and focus on other things instead. Well, today it’s getting fixed damn it! 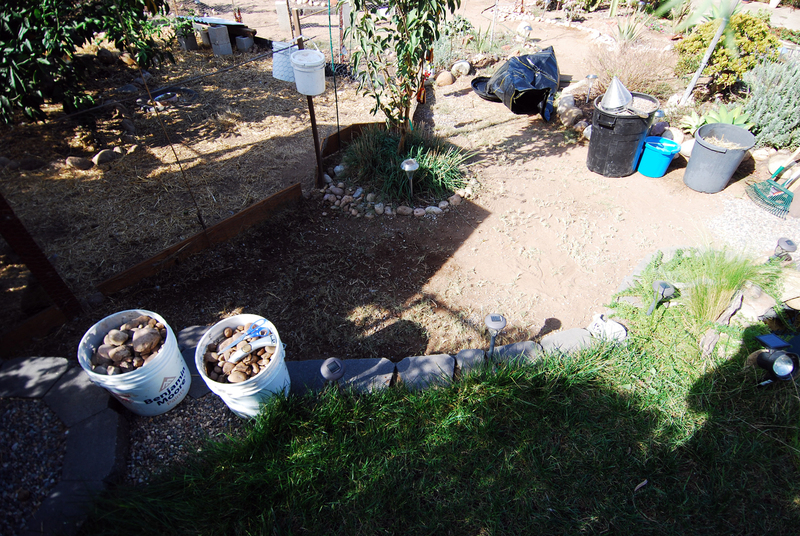 The first step was to re-remove ALL of the pea gravel as well as ALL of the river rock while trying to keep all the dirt and dead grass and debris out of it. Tons of fun this afternoon! After a few hours, I got everything fairly cleared away. I pulled as much of the crabgrass as I could bear to do seeing as this was the second time around. I wanted so badly to just blast it with Roundup just to teach it a lesson. But, that’s not how I roll. Roundup is made from Nazi tears and I will never add any chemicals to my yard. Ever. I also imagined using some Napalm from a tiny remote control helicopter blasting The Flight of the Valkyries by Wagner to reenact a scene from Apocalypse Now. I then did what I should have done the first place. I went out and bought some cheap weed barrier material. After punching the crabgrass and doing some pile drivers off of the top of the chicken coop to finalize its humiliation, I began to lay down the barrier. Take that evil crabgrass! You’ve seen your last ray of sunshine sir and will be undone! 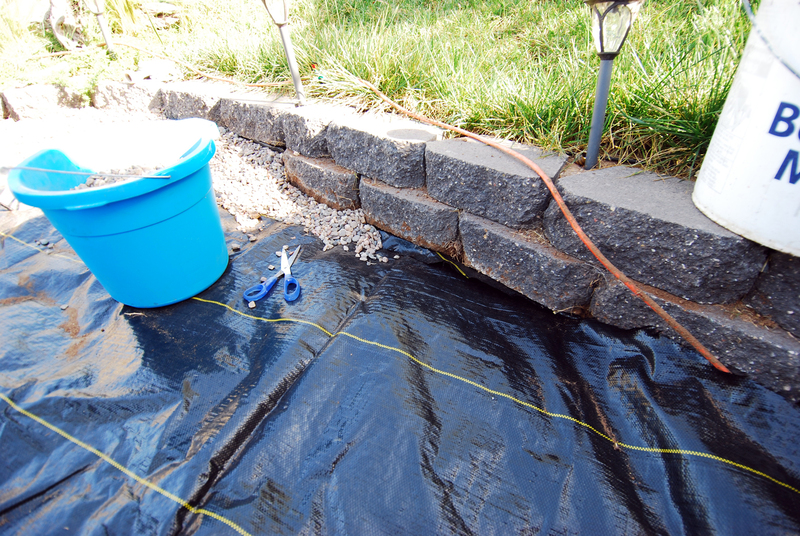 I then realized that the area surrounding the low wall needed to be better protected because the weeds would just sneak on through between the stone and the weed barrier. 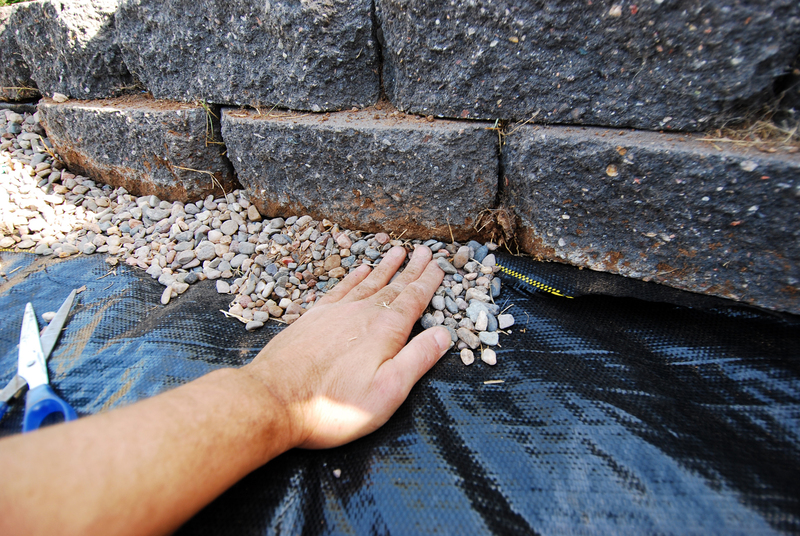 So I dug underneath the wall a bit to shove the barrier into the gap and then place the stones over that. Nice and snug! 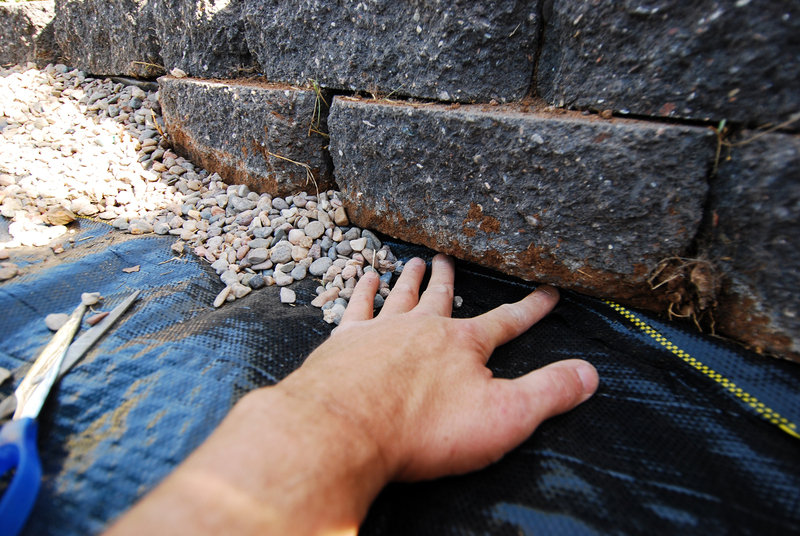 I went in about 2″ underneath the whole wall in hopes that no sunlight will penetrate at all. If one tiny little ray of light enters, then the crabgrass will grow right back again. I have absolutely no interest in doing this a third time! 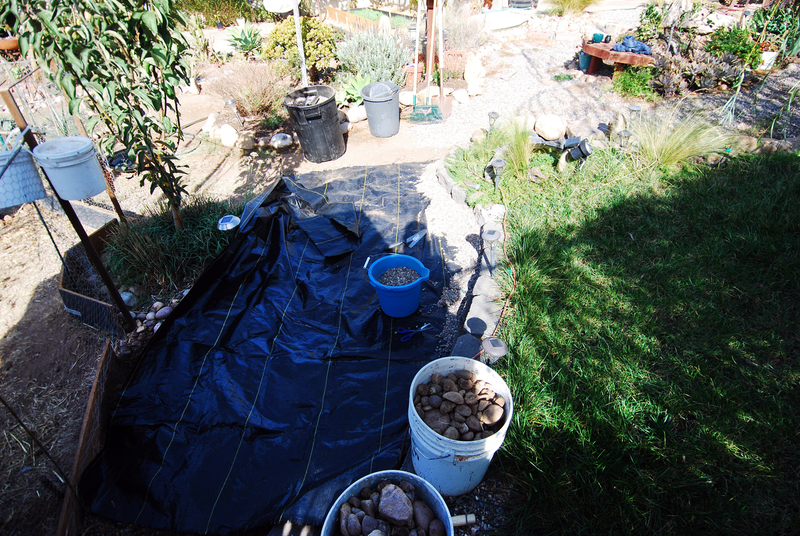 I then moved on to the river rock section along the side of my chicken paddock and around the apple tree. That tree, by the way, is a Granny Smith and a Pink Lady planted in the same hole. The goal is to have them grow together forming one trunk. This way, future generations will be amply confused when two different varieties of apples are produced from the same tree. I’m sneaky like that. This weed barrier is supposed to be light proof but not water proof. 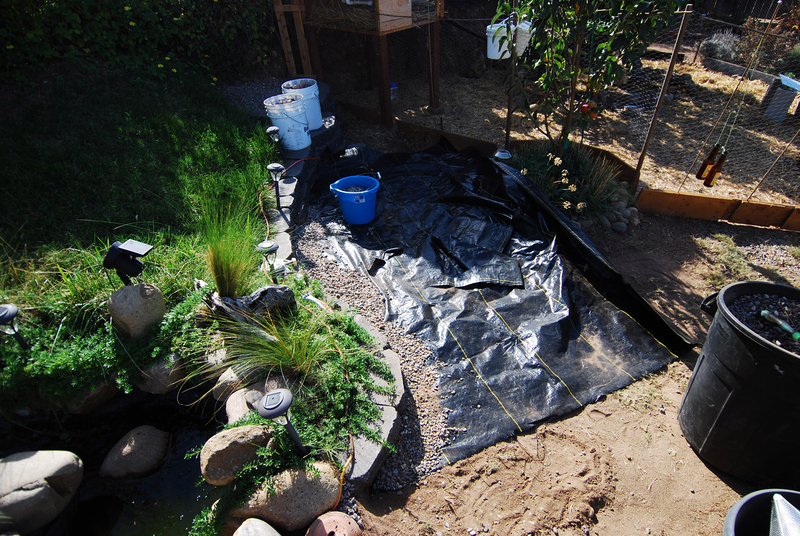 So, hopefully, my trees will get enough water when and if it ever rains. Time will tell. Last winter it didn’t rain at all so I was unable to test all my grading and leveling I’ve done with the landscaping thus far. This year, being an El Nino year, should prove to be a wet one. I hope. 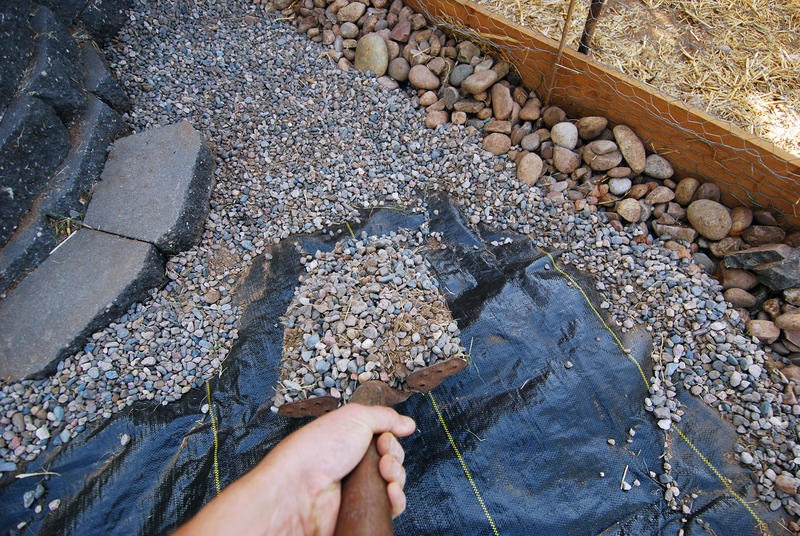 Once the borders of the pathway were well secured, I began re-re-adding the pea gravel. I discovered that I wasn’t able to reclaim all of it initially so I didn’t have enough to finish the section. Sad news in pea gravel town. It was also filled with bits of dead grass and a dusting of dirt that I tried my best to sift out as I went along. In the end, I will have to buy a few more bags to finish the job as well as more barrier to redo all the paths I’ve done already. As well as the paths I’ve yet to do. This will be a test to make sure that all is well before moving on to more backbreaking endeavors. With a light blast of the hose, I was looking good again. Here’s a little before and after action for ya. We spare no expenses when it comes to special effects! And here’s the final product. Or at least this section of the final product. Ahh, much cleaner! Here’s to it staying that way. Lesson learned? When you know the right way to do something, don’t cheap out or get lazy. Do it right the first time. It’s my hope that, if you decide to do this project, you learn from my mistakes and be smarter than I am. Which won’t be that hard to accomplish. This is a prime example of what I meant in the beginning of my blogging experiment about me not having all the answers and not being a professional landscaper. I will always try to be one step ahead so at the very least you can learn some tiny iota of the pitfalls of gardening and landscaping. I am no stranger to eating crow and this will not be the last time. Until then, I will be sitting on my mini wall picking crow feather from out my teeth. Another great read! I am very proud of all of your accomplishments and determination. I believe I learn best by watching these things in action first hand. Let me know when you arrive for that to transpire. I will be your devoted apprentice and photographer. Hahaha! I love the way you write. 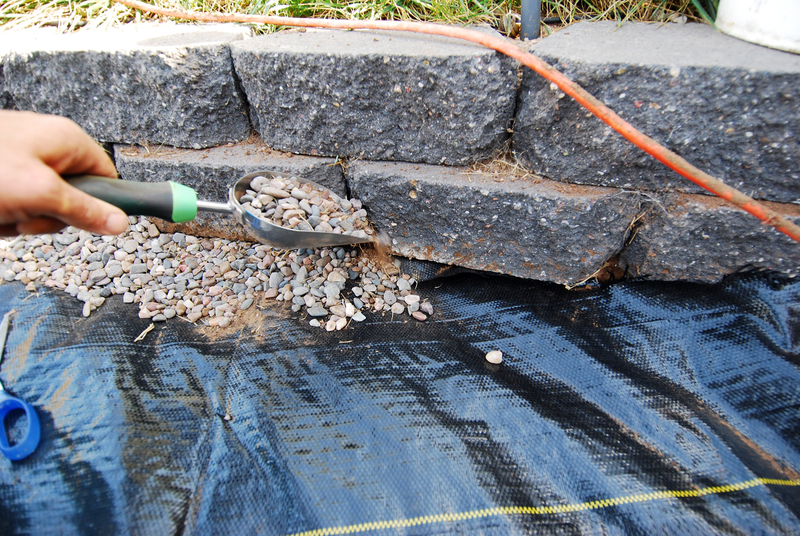 🙂 I used weed barrier fabric when I built my rock and cactus garden about 4 years ago. Unfortunately for me (in this case) water is abundant in Florida and the barrier was eaten away after about a year. I’ve been thinking about using old carpet samples next time and cutting holes for my cacti. I’m not sure if there are chemicals in the carpet that could leech into the ground though. But I keep my herbs in containers and I’ve never had any luck with my citrus trees so I’m guessing it would be ok. I also did an experiment with newspaper and mulch on the side of the house. 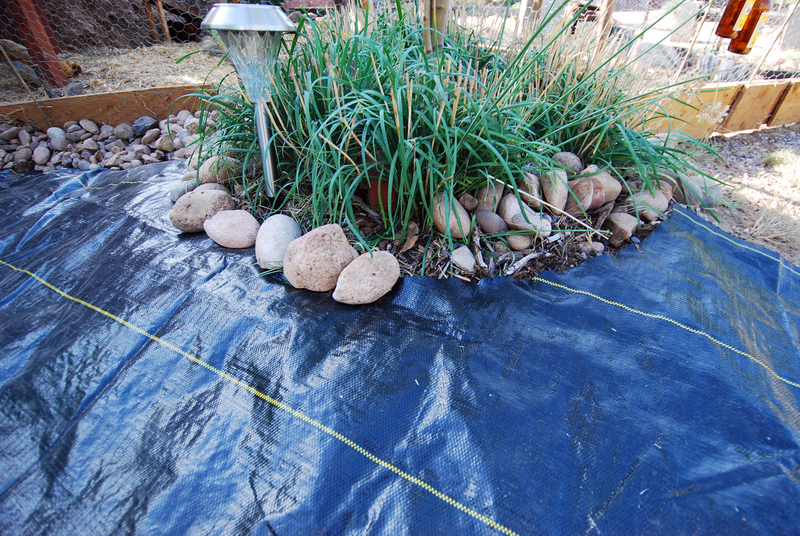 The good news, newspaper makes a good barrier and can be laid down on top of the grass – mine is a mixture of St Augustine (very hardy with shallow roots for Fl sandy soil) and pasture grass (very cheap solution from the previous homeowner). The bad news is that the mulch came from the local recycling center around the corner – a mixture of unrecognizable organic “stuff” and the occasional chunk of glass – that was infested with these little sticky slivers that turned out to be some kind of invasive plant. This lovingly covered the rest of my lawn and produced thousands more of those damn seeds (that are now all over my dog and my house). That sound really annoying Nanc E Pants. I had a similar experience with sedge weed. Put I was doing it to myself (as usual). Turns out that sedge is the one weed seed that’s fairly impervious to the heat generated by my compost pile. 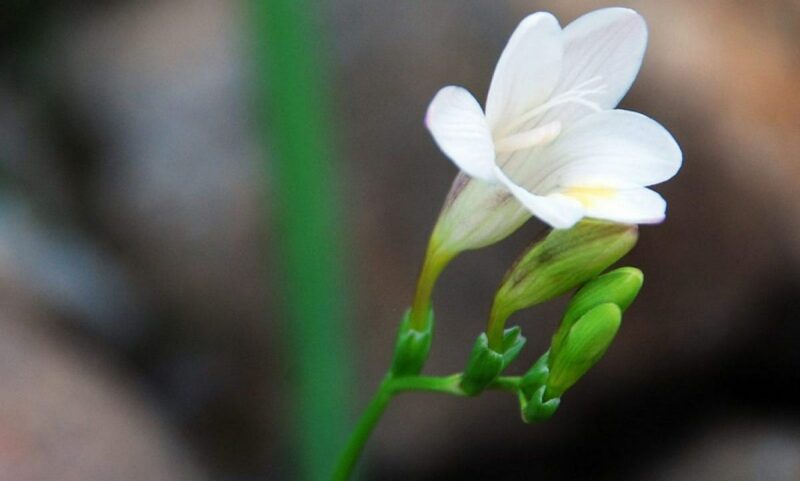 I was inadvertently spreading it all over my beds and then watering and fertilizing it diligently and religiously. I now treat it like a hazmat situation or a zombie outbreak. I even have to sweep up under it when I pull these evil shits out of the ground. I like your use of the newspaper as a barrier. I just tried using wet cardboard around my veggie garden as a test barrier. Which is working great so far. I’m not sure about using carpeting. 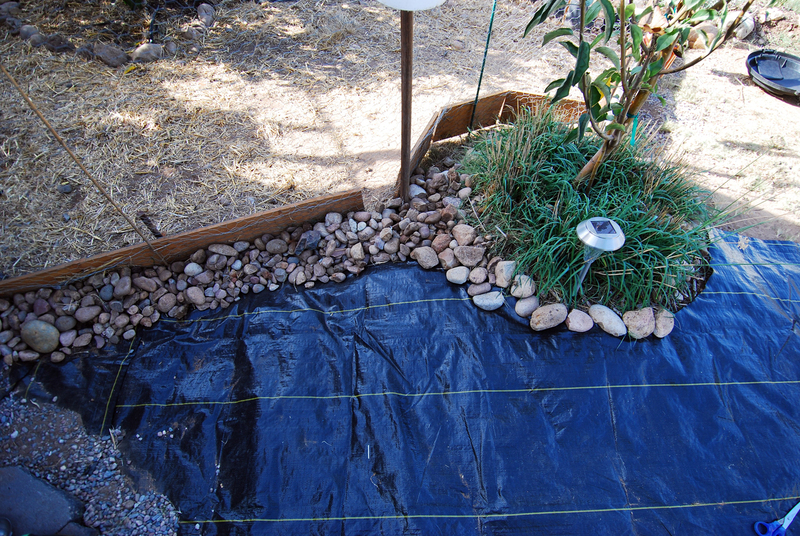 I did use that as padding under my pond and stream before adding the rubber lining. But as a weed barrier, I’d be cautious. Not only for possible contamination, but I’d imagine that weeds might weasel their way through the weave. Eventually. I thought about salting the earth a bit as well to try to contain my outbreak of crabgrass. Or even performing some pagan ritual to rid the evil spirits. That crabgrass pops up in certain places and no thickness of mulch will stop it. I even dig down about 8 inches to get at its roots but it ALWAYS creeps back somehow. I think I need to get down past the earth’s mantle and scortch the earth with hot magma to rid myself of this nuisance. What kind of issues do you have with citrus? I’m finally having good results after many failed potted attempts. Thanks dear! Let’s hope that this one sticks! I do not wish to do that again. More often than not, a dirty air filter is the reason your home is giving the sauna at your gym a run for its money. Basically, it is relatively easy to upgrade the surrounding area of the fireplace, aside from the mantle. 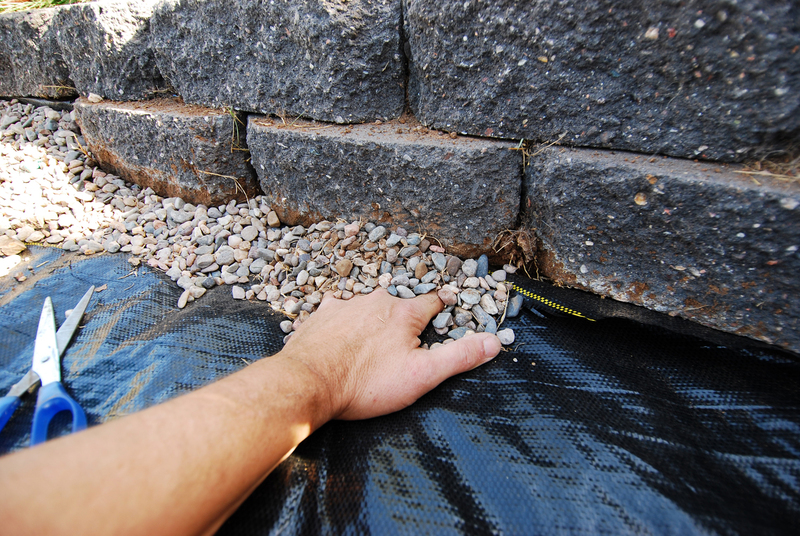 You may even want to consider just getting a credit card from a home improvement store. I won’t say that you don’t know what you’re talking about. I will say that I don’t know what you’re talking about. I spent the day redoing a few projects at my place today. Not because I wanted to, or didn’t have better things to do, only because I cut corners and it showed. Gotta do it right the first time or it takes twice as long. Nice before and after shot. Looks great man. I am going to go watch Apocalypse Now, now. Thanks Blue, I’m glad I’m not the only shortsighted person in the world! I see what you did there with the now now. Very good sir, very good indeed. Very nice post. I simply stumbled upon your blog and wanted to say that I’ve really loved browsing your blog posts. After all I will be subscribing on your feed and I hope you write again soon! Hey thanks Someone. Very mysterious name! I’m glad you found your way here! I’ll be writing again after the Thanksgiving madness that is heading my way tomorrow. I’m glad you’ll be following mindyourdirt.com! I can promise you it will never be boring and always rediculous. did it ever grow back ? Hi Mike. The barrier definitely cut back almost all the weeds. Except crab grass. That just pokes right through any permeable barrier. Even rubber sheeting! Like in my pond and stream. The weed growth is nowhere near the levels it is on my un-protected portions of the paths though. So there is a noticeable difference. That said, I’ve since changed gears in my fight against weeds. A real slash and burn method that makes weeding wayyyy too much fun. Flamethrower!! Next PostNext My Very First Egg. Ever!